The Petrified Forest National Park is located on the Painted Desert in the southern part of the Colorado Plateau. The Chinle Formation of Late Triassic Period (more than two hundred million years ago) constitutes the main geological formation of the Painted Desert. Thus, the visitor has the option of visiting two outstanding museums in the area: the Painted Desert Visitor Center and Rainbow Forest Museum. Sites within the area include the Painted Desert Inn, a National Historic Landmark, and two ancestral Pueblo sites; Puerco Pueblo and Agate House, each of which represents the rich human history of the park. 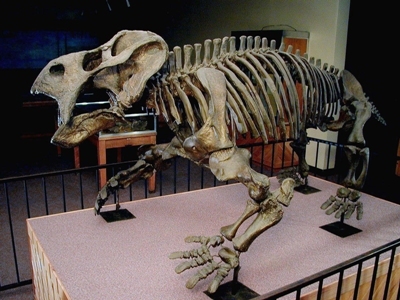 Many Late Triassic Epoch fossils discovered in the park are showcased at the Rainbow Forest Museum. The museum Placerias is a resin cast of an individual found near St. Johns. Forty Placerias were identified in the St. Johns area. This creature, which must have resembled a hippopotamus, was not a dinosaur, but a dicynodont or “two-dog tooth” so called because it had toothless jaw margins with only the two canine teeth. Placerias was a sturdy animal with tusks for rooting through the soil in search of vegetation and a beak for uprooting plants. Fossil evidence from the tusks of other dicynodonts show wear patterns of alternate deep grooves and a smooth polishing effect. Newswspaper Rock petroglyphs — ancient symbols pecked into the surface of rock — can be found throughout the park. The petroglyphs of Newspaper Rock are etched into dark rock varnish to expose the lighter color of the rock beneath. Rock varnish is made up of a thin natural veneer of manganese, iron and clay that covers the exposed surfaces of the rocks. Newspaper Rock sandstone is very fragile. Beneath the sandstone are mudstones that erode easily and the sandstone fractures increases and the sandstone falls away from the cliff. The most popular feature of the park is the petrified wood. Several trails wind amidst the beautifully colored and fascinating petrified logs, including Crystal Forest whose logs contain beautiful crystals; Long Logs which has one of the largest concentrations of petrified wood in park, and Giant Logs which features some of the largest and most colorful logs in the park. The brilliant colors in the petrified logs come from trace minerals: pure quartz is white, manganese oxides can form blue, purple, black, and brown, carbon is black and iron oxides provide hues from yellow through red to brown. Each year, tons of petrified wood are removed illegally from Petrified Forest National Park. Theodore Roosevelt created Petrified Forest National Monument on Dec. 8, 1906. Petrified Forest was designated as a national park on Dec. 9, 1962. There are 93,533 acres (about 147 square miles) within park boundaries, with a recently expanded boundary increasing the acreage to 218,533 acres, authorized in 2004. Intermountain Basin semi-arid steppe and grassland (short grass prairie) constitute the main environment of Petrified Forest National Park. Hundreds of species of plants and animals can be found in Petrified Forest National Park. Residents include pronghorn, Gunnison’s prairie dog, coyote, bobcat, bullsnake, Arizona tiger salamander, meadowlark and golden eagle. There are more than thirteen thousand years of human history in Petrified Forest National Park, which includes more than eight hundred archeological sites. Puerco Pueblo, built by ancestral Pueblo people, was occupied between A.D. 1250 and 1380. Agate House, occupied about A.D. 1100-1150, was built out of pieces of petrified wood. Herbert David Lore built Painted Desert Inn by 1924. Using designs by National Park Service architect Lyle Bennett, the Civilian Conservation Corps (CCC) reconstructed the Painted Desert Inn in the late 1930s and hand painted the inn’s sky light. Recently, the building had an extensive rehabilitation, returning the inn to its 1949 appearance. Don’t miss the Buffalo dance mural by Hopi artist Frank Kabotie. This work was commissioned by Mary Elizabeth Jane Coulter, Grand Canyon architect and interior designer, who worked on design elements of the inn between 1947 and 1949. Originally, the Painted Desert Inn served as a restaurant and hotel for travelers on Route 66. Today the building is on the National Register of Historic Places. The Petrified Forest National Park is the only national park site that contains a segment of the historic Route 66 alignment. Part of the National Old Trails Highway also passed through the park. During the summer Native American silversmiths, dancers, weavers and potters provide cultural demonstrations. It is all very good to probe the causes of the Painted Desert and the Petrified Forest, but it is also good to just enjoy the wonderful splendor of places such as this. The Valle of the Planes is located near the Grand Canyon in Arizona at Grand Canyon-Valle Airport, an old Trans World Airlines (TWA ) base and the former Grand Canyon Airport. The museum houses a collection of more than twenty rare aircraft in one hangar and an outdoor park. The pride of the collection is a Lockheed C-121A, the military version of the famous Constellation airliner of the forties and fifties. This aircraft, built in 1949, has a distinguished history, starting with service during the Berlin Airlift in 1949-50. Following the end of the airlift, the aircraft was fitted with a deluxe interior for service as a VIP transport. It was issued to General Douglas MacArthur and was called the “Bataan,” after the infamous Bataan Death March which troops under MacArthur had endured in 1942. MacArthur used the Bataan during the Korean War, when he was Supreme Commander of Allied Powers. This airplane carried him to his famous meeting with President Harry S Truman on Wake Island, and to the United States after his dismissal by Truman for making political statements about the conduct of the war. In 1966, the Bataan was stripped of her interior and flown to the “boneyard” at Davis-Monthan AFB in Tucson. Later acquired by NASA, the airplane was fitted with computers and telemetry equipment and used in support of the Apollo moon program. Retired once again upon the drawdown of the space program, the Bataan was flown to Fort Rucker for display at the Museum of Army Flying. 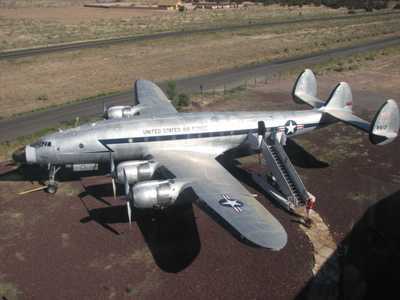 The aircraft was kept on outdoor display there, and was acquired the Grand Canyon Air Museum and restored to flying condition, it arrived in Arizona in April 1995. The Bataan represents the days when the Constellation was the “Queen of the Skies.” Visitors can take a guided tour of the interior of this historic aircraft. Another exhibit is a 1929 Ford 5-AT Trimotor, one of just three still flying in the world. Built by the Ford Motor Company, the Trimotor introduced new standards of luxury and speed. The aircraft on display at the Grand Canyon Air Museum served with various airlines in Central America, returning to the United States in the sixties for promotional work with TWA. This Ford Trimotor was used by Scenic Airlines for tourist flights over the Grand Canyon until Federal noise regulations forced its retirement. The museum is famous for its vintage fighter aircraft collection. The P-51A on display is one of the oldest Mustangs still flying. The F-86A is a Korean War veteran. The Messerschmitt Bf109G-10 was captured in Germany at the end of World War II. This aircraft was flown from its base on the Eastern Front to surrender to the American forces near Munich in May 1945 because of the poor treatment of German fighter pilots by the Russians. During World War II, the United States alone produced more than three hundred thousand military aircraft. When the war ended, most of these airplanes were scrapped at vast disposal centers.